Assassin's Creed IV: Black Flag is a vast game. Edward Kenway's groovy pirate adventure will likely devour the free time of more than a few history buffs over the next few weeks. But while all pirates sail the same seas, not all of them are as smart about it. 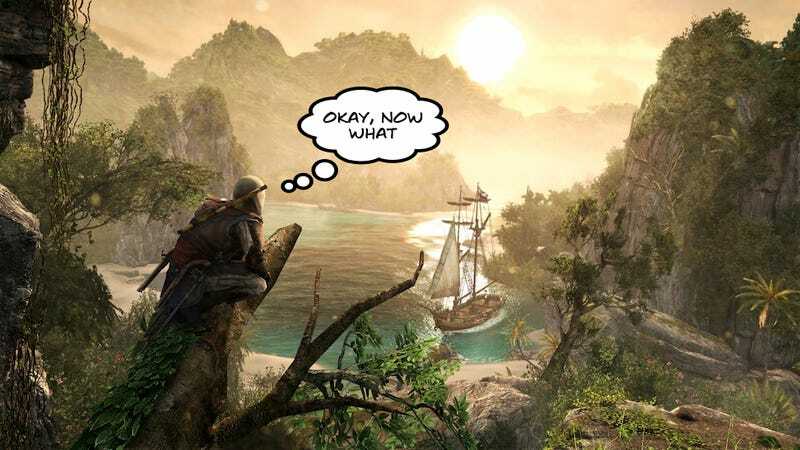 After spending 30+ hours adventuring through Black Flag's version of the Caribbean, I thought I'd jot down some tips to help everyone else have smoother sailing. Ready? Let's go. Play online, if you can. I played the bulk of Black Flag more or less offline on a debug PS3, and after talking to Stephen (who played a retail version of the game online), it became clear that playing online makes it a lot easier to make money. That's because the game contains online-only "social challenges"—gold-laden ships, hidden treasure and rare harpooning challenges that open up and offer you fabulous cash rewards. Stephen had a much easier time paying for the upgrades he needed in the early goings than I did. The "Fleet" minigame, additionally, is only available online. I found it too tedious to sink much time into it, but it does seem like it could be a decent source of income if you dedicate some time to it. That said, if you want to make the game more of a challenge, play offline. I can attest that it's doable, it'll just mean more grinding for less money in the early goings. Don't reduce your wanted level. Money won't be too much of a problem as long as you're playing online, but materials will be. You'll need lots of metal to upgrade the Jackdaw and her guns, and the easiest way to get that is by boarding and sacking military ships. However, those can be hard to come by in the early goings… unless you get a wanted level. After you take out a few ships, you'll get a GTA-style wanted ranking and red-sailed "pirate hunters" will come after you. These ships always have metal, and can be a great way to farm for upgrade materials. After taking one down, you'll have the option to reset your wanted level, but don't do that. Let it keep climbing, and keep on taking down ships. In about an hour, you can earn a ton of metal and even if the high-level mega-ships that eventually come after you take you out, you won't lose any of your earnings. Sail a lot in the early goings. One of the best things about Black Flag is that there's a new, incredibly useful fast-travel system. In the early goings of the game, you'll have to sail a lot to get where you're going. This is good: Be sure to sail over and pick up any loot you may pass by. It's very a cinch to grab it and it'll add up. Take out a lot of ships, too. You may want to power through the story missions of Black Flag, but it's worth taking the time to do some real piracy. If you take down a bunch of ships, it'll be much easier to upgrade the Jackdaw for the more difficult later missions. Also, piracy is fun. Level up your swivel guns early. Of all the upgrades you can give the Jackdaw, armor and main cannons seem like the two most useful. And they are useful. But the swivel guns—the guns that automatically target an enemy ship's weak points after scoring a hit with cannons—are the Jackdaw's secret weapon. They're the thing that allows you to take down three powerful ships without sinking yourself. Upgrade them as soon as you can to do more damage and fire more shots. Use the swivel gun before boarding. You've got a lot of freedom when it comes to boarding ships, but before you leave the Jackdaw, be sure to take the enemy-facing swivel gun and take out as many crew members as possible. It's surprisingly easy to get killed while swordfighting on the enemy deck, so the more dudes you can kill before leaping over, the better your chances will be. When fighting more than one ship, board and repair mid-fight. This is a tricky trick for tricksters, but it makes it much easier to survive a pitched sea-battle. If you're taking on more than one high-level ship, focus your attention on just one of them. Cripple it and board it, and when given the option, choose to repair your ship. Voila! It's like grabbing a health-orb in the middle of a fight. You'll know a ship is clear for boarding when its powder keg explodes and its sails catch fire. It'll look like it's going down, but be careful not to loose another fusillade into it, or it'll sink and you'll lose your chance to board. The moment you begin boarding, the other ships will stop shooting you, so you'll be in the clear. Don't forget about your mortars. This is the other biggest ship-on-ship tip: Don't forget about your mortars! You'll get them early in the game, and can access them with the L2 button (LB on Xbox). They're incredibly powerful, and much more accurate than the mortars that enemies will use against you. If you're taking on a powerful enemy ship, soften them up with mortars beforehand. Mortars are even more useful on forts, which can take a lot of punishment from your main guns but seem significantly more vulnerable to mortar rounds. You also won't come across mortar ammo on the seas as often, so be sure to stock up when you're on land! You can buy the materials for some important upgrades. At general stores, you can actually buy the animals hides you'll need for some basic upgrades that'll make your life a lot easier. Specifically, the hides needed to make ammo pouches for your blowgun and pistols, which will help you go a lot longer without restocking. Pay attention to the map of Templar Hunt quests. There are four Templar Hunt quests that you can undertake to unlock a decent set of Templar armor. The armor itself isn't my favorite—it doesn't make Edward that much stronger and it looks funny—but the missions to get the armor are pretty cool. However, while three of the missions are located in the three main cities, the fourth one is on an island northwest of Kingston. It's marked on a map that you can find in the plantation house on Great Inagua, but it's easy to forget where it is and spend ages scouring the map for it. Make a note early on for where to find it. Fight smart: Use guns and smoke bombs. The combat in Black Flag is a good degree more challenging than past games in the series. As a result, you'll want to fight smart, and sometimes dirty. If you're in the middle of a ship-boarding, low on health and worried about having to start over, throw down a smoke bomb. It's a bit of a cheat, a get-out-of-jail free card that'll let you effortlessly kill three or four dudes, even the heavies. But hey, no one said pirates fight with honor. When running around on land, when you tease the thumbstick left or right, Edward will "Juke" without fully turning himself. It's a good move to master, not only because it looks cool but because it can help you dodge enemies and enemy fire without deviating from your path. Stealth in Black Flag is greatly improved compared to past games in the series. One of the things that makes sneaking a lot more fun is that you can now tag enemy patrols and keep an eye on them through walls. Edward can tag a pretty large number of enemies, and every time you head into a new area, don't forget to snap on Eagle Vision and capture as many enemies as you can. It'll make your life a lot easier. In the modern-day stuff, seek out the audio logs. There are a lot of things you can collect in the offices of Abstergo Entertainment. Without spoiling too much, there are audio diaries that are easily the most rewarding things to collect, particularly for longtime fans of the series. Take the time to track those down and listen to them. Don't sink money into your pirate hideout. Early in the game, Edward unlocks a hideout on Great Inagua. If you want, you can sink money into upgrading this place. Don't. The upgrades are mostly cosmetic, and there are far more worthy things to spend money on. Pay attention to optional mission objectives. The optional mission-objectives aren't just bonus challenges, they offer great ideas on how you can approach each one. If an optional challenges says "Take out five guards from cover," you know there'll be a lot of cover to use. If it says "Don't get spotted," you know it's possible to play the entire mission from stealth. "Air assassinate your target," "Use a rope swing to assassinate your target," and so on and so forth. Remember to sell your sugar and rum. Two of the materials you'll loot from enemy ships have no use except to be converted into cash. In the early goings, don't forget to sell sugar and rum as soon as you can, since you won't need them for anything else. Buy the black privateer outfit so you look like the Dread Pirate Roberts. The white and blue Assassin's robes are all well and good, but let's be honest: black is way cooler. It's worth dropping 5k on the black Privateer outfit, which will make Edward look ready to take on an army of ROUSes. Chase down sea shanties. They are the best. Black Flag's collectible sea shanties are the best. With each one you capture, your crew will learn a new song and sing it the next time you travel. You'll quickly get tired of hearing the same ones over and over, so it's worth taking the time to run down new shanties whenever you see one. For bonus points, try to figure out which crew members are singing which songs—some of the guys have lovely voices, and some are… well, let's just say "untrained." Those tips should make for smoother sailing through Black Flag's deadly waters. Keep a hand on the wheel and an eye on the horizon, and remember: Always steer into rogue waves.